The new for 2018 Mazda CX-5 sits on the old platform, the wheelbase is the same size, but it’s 10mm longer, 35mm lower and much sharper-looking thanks to smaller lights, a longer bonnet and wider grille. 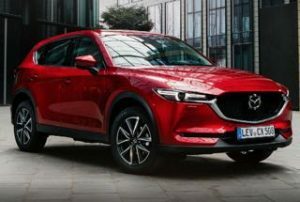 Mazda, with their Kodo design philosophy, believe small design improvements add up to make a big difference with the focus being on all-round refinement. We can buy into this philosophy as the CX-5 is a much more appealing proposition. The seating is comfortable and its easy to find a good driving position, the suspension is a little on the firm side so potholes can be jarring, particularly with the larger 19 inch tyres, but out on the open road it’s great – with nicely weighted steering, very little side to side movement and it can raise a smile on the more twisty roads too, comparable to the Seat Ateca and Ford Kuga. The major changes to the CX-5 are externally, the aforementioned larger grille and slim head and tail lights. The interior of the CX-5 looks much as before, but feels very different thanks to Mazda’s use of higher-grade materials. Surfaces are pleasantly tactile while discreet chrome highlights convey a real sense of quality. There’s up-to-date technology, too, including a prominent seven-inch infotainment screen. A conveniently located rotary controller avoids you having to reach to operate it and smudging the screen. 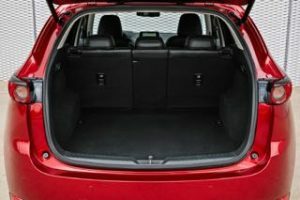 Mazda CX-5 passengers will find interior space to be more than adequate, although the 506-litre boot is a little smaller than the 615 litres the VW Tiguan can provide if its adjustable rear seats are slid fully forwards. If the boot frustrates, though, it’ll soon be forgiven when you experience how quiet the Mazda is inside. Engine noise is subdued and carefully considered sound-deadening blocks the worst of the rumble from the car’s wide tyres. The new CX-5 has two trim levels, SE-L+ and Sport+. SE-L+ has 17 inch alloy wheels, LED headlights including LED daytime running lights and LED front fog lights, adaptive front lighting System, dusk-sensing lights, heated auto power-folding door mirrors, front and rear parking sensors, driver and front passenger seat height adjustment, electronic parking brake, rain-sensing front wipers, Cruise control, dual-zone climate control air-conditioning, engine start / stop button, 7 inch touch-screen display with sat nav but no Apple carplay (this is being added for MY19 cars, speak to dealer to make sure you are getting MY19), advanced braking support, cruise control and lane departure warning and lane keep assist. Sport+ models add 19 inch alloy wheels, reversing camera, power tailgate, leather trim, 8-way power adjustable driver seat with memory and 6-way power adjustable front passenger seat, heated front seats, heated steering wheel, windscreen projected display, keyless entry system, Bose sound system with ten speakers and power tilt and slide sunroof (petrol and AWD Diesel models only) One point of note is that the CX-5 can feel quite dark inside, Sport+ trim customers can upgrade to ‘Stone’ leather seats for £200. 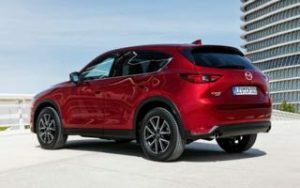 The Mazda CX-5 is available with a non-turbo 2.0 litre petrol engine producing 163bhp. A six speed manual or six speed Automatic gearbox is avaialble. The engine is much lighter than a diesel unit, (135kg lighter) making it the most fun CX-5 it is also smooth, free revving and very quiet, there are mixed reports over a lack of mid range grunt and a gap where a turbo would assist so you must drive this car prior to ordering, three years is a long time to drive a car you don’t get along with. 62 miles per hour can be reached in 10.3 seconds (9.8 as an Auto) and economy is an excellent 44.1 miles per gallon. (42.8 Auto) This engine does return very good returns on all posted real world mpg figures which suggests 40mpg can be a reality. The Diesel engine is not avaialble this quarter, talk is of a new, more powerful 190 bhp diesel offering for next year.